Don’t let the title fool you – yes, there is an exorcism but, more than that, this story is about a strong friendship that endures over seventy years and I enjoyed the hell out of this book. As the setting is in the 80’s, when I was a teenager, the references to television shows, movies, fashion, and slang brought back memories – some fond, others horrifying. Each chapter name is taken from popular songs or lyrics from that time (Don’t You Forget About Me, We Got The Beat, Sunday Bloody Sunday) and aptly describes the contents of that chapter – something I thought very clever. The author perfectly captures the angsty, hormone-riddled interactions between the high school students and their attitudes and reactions are entirely believable and genuine. Why anyone would want to relive those years is beyond me. More satirical than horror, this book contains humorous, repulsive, and even touching moments demonstrating the bond between Abby and Gretchen, but horror fans will also be satisfied with some creepy and chilling content. Readers who grew up in the 80’s will especially enjoy this book, as well as those who prefer their horror on the lighter side. 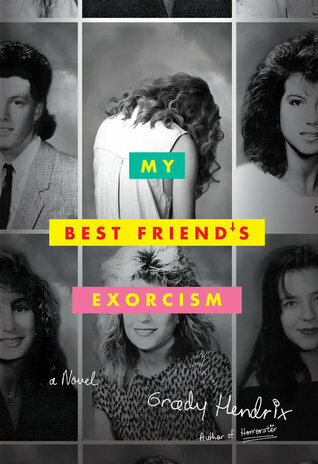 My Best Friend’s Exorcism is scheduled for publication May 17th, 2016. Thanks to Edelweiss for sending me an ARC in exchange for an honest review. I really loved Horrorstor by this author, but just couldn’t dredge up much interest in reading this book, which is unusual bc it’s my favorite type of book. Haven’t read that one, but heard good things about it. I had a great time reading this one – maybe because of the 80’s setting.